Yeah 20 great years of killing your opponents in brutal ways. I remember seeing someone play at an ice rank back in December 1992 when I was a little kid. The one thing I thought was cool was someone playing as Rayden uppercutting someone into the pit. Then he lost to Johnny Cage when I saw the Uppercut Decap fatality and my mind was blown away. Since I was on sports teams, arcades were a way to celebrate the end of the season. I played Mortal Kombat and saw the Spine Rip from Sub-Zero. I got the PC version a few years later and played that night and day. <br/> <br/>When MK II came out, I was hooked on it unlocking all of the special moves an characters. <br/> <br/>MK 3 to me was good and bad. It was good in the fact that it expanded into combos, but bad is that one of my favorites Cage was dead and no ninjas. UMK3 was a quarter muncher as well as Trilogy on PC (which I got at a bargain store). I wasn't really good with fighting the AI. <br/> <br/>MK 4 I liked mostly because of my favorites returning. After that, I lost interest in MK. <br/> <br/>Deadly Alliance got me back to playing MK and I was a huge fan of Deception. I liked those two the most because the story was well-done and character development. Then Shaolin Monks came out and I thought it was awful. Armaggedon I didn't play because well I was expecting the One Being to come in the next one and not Blaze on steroids from a prophecy. <br/> <br/>MK vs DC I liked and it showed MK can do crossovers. I didn't mind the T rating keep in mind Nintendo make MK 1 non-bloody. <br/> <br/>MK 9, to me, was a back to basics. While I had some issues with the Story, I enjoyed playing it with the X-Rays and nods to past MK's. I got my wish since I was 11 to see a Cyber Sub-Zero and a Human Smoke again. I loved how it took hints from Street Fighter 4 and other games. I worked second shift so I got out at 11 and waited for it since I put it down. The DLC was neat and I still have fun playing it. MK 9 despite it's flaws I had with it reinvented the franchise and will keep it running for a while. <br/> <br/>I'm looking forward to the next MK and what they're going to do with it. <br/> <br/>That's my story with MK! I remember seeing someone play at an ice rank back in December 1992 when I was a little kid. The one thing I thought was cool was someone playing as Rayden uppercutting someone into the pit. Then he lost to Johnny Cage when I saw the Uppercut Decap fatality and my mind was blown away. Since I was on sports teams, arcades were a way to celebrate the end of the season. I played Mortal Kombat and saw the Spine Rip from Sub-Zero. I got the PC version a few years later and played that night and day. When MK II came out, I was hooked on it unlocking all of the special moves an characters. MK 3 to me was good and bad. It was good in the fact that it expanded into combos, but bad is that one of my favorites Cage was dead and no ninjas. UMK3 was a quarter muncher as well as Trilogy on PC (which I got at a bargain store). I wasn't really good with fighting the AI. MK 4 I liked mostly because of my favorites returning. After that, I lost interest in MK. Deadly Alliance got me back to playing MK and I was a huge fan of Deception. I liked those two the most because the story was well-done and character development. Then Shaolin Monks came out and I thought it was awful. Armaggedon I didn't play because well I was expecting the One Being to come in the next one and not Blaze on steroids from a prophecy. MK vs DC I liked and it showed MK can do crossovers. I didn't mind the T rating keep in mind Nintendo make MK 1 non-bloody. MK 9, to me, was a back to basics. While I had some issues with the Story, I enjoyed playing it with the X-Rays and nods to past MK's. I got my wish since I was 11 to see a Cyber Sub-Zero and a Human Smoke again. I loved how it took hints from Street Fighter 4 and other games. I worked second shift so I got out at 11 and waited for it since I put it down. The DLC was neat and I still have fun playing it. MK 9 despite it's flaws I had with it reinvented the franchise and will keep it running for a while. I'm looking forward to the next MK and what they're going to do with it. That's my story with MK! The first time I ever heard of MK was..
A friend of mine told me he saw a fighting game with real persons and real blood. And I was like, uh uhh. Some time later he showed me MK for the super nintendo. I was blown away by the grafics, the fatals and everything. After a short while we got our hands on a copy, 3x 3,5 inch floppydisk hahahah, of the PC version..WITH BLOOD..ooh..this version was even better and bloodier..from that day on..total crazyness!!. The thing I didn't like about MK was the Kano-Rayden Endurane..damn difficult!! The funniest thing about MK was..playing MK with all my friends. When we finished Shang everyone was so excited they all jumped on me. But I was also very excited and I didn't let the controller go.. So their weight pushed me back and the Snes went up and came down with a bang..ejecting the game..the day after we finished Shang again. But my friends and I can still laugh about the grouphug haha. When MK2 came out and we saw it for the first time on the arcademachines it was still unbelieveable, we still couldn't believe what we were seeing. Everything was better than the first game, we were blown away for the second time, and me and my friends wanted to play the whole day..then I came to realise..I was addicted to MK.. I believe everybody at the time was addicted to MK2, my father played it, my little nephew 7jears old at the time played it, the older guys from the neighbourhood played it, the owner of the arcadehall played it. Everywere MKMadness. One of the funniest memories I have playing MK2 was.. I was probably the only under-age boy playing MK2 in the arcade(in our city), because I was tall for my age and the owner believed I was 18. Here in holland every game machine was put in these gamblehalls and you have to be 18 to enter..so my friends were looking trough the windows and now and a wile some of my friends sneaked in. He then stood between the older guys so no man can see him. haha. IMO MK2 is still the best 2D MK game i have ever played. This game got my head upside down. I was realy excited when I saw some pictures in the gamesmaster magazine, as time went by I was starting to miss some of the key figures. No masked Sub, no Scorp, no Rep, no Cage, etc. But the gameplay was fast and good, I liked the new combo system and the fatals were great. Lots of blood and gore. Sometimes I wonder how MK3 would have looked like if al the keyfigures were in from the beginning. Daniel Pesina, Ho Sung Pak, Katalin Zamiar etc. I think that the game probably would have been even better than MK2..but it didn't happen so. I like the game and played it alot in the arcades but it wasn't the best MK I played. UMK3 was a lot better than MK3 and I think It was almost as good as MK2. IMO some details could have been better, for example Sub's stance is like Scorp.mmmm.. The arcadeowner in our town didn't have UMK3 because he recieved to much fines because a lot of under-aged people came into his arcadehall. Overall MK is my favourite fighting game of all time and I still play it today. I have MK, MK2, MK3 and UMK3 for the super nintendo which I play sometimes. I am searching for a MK pcb. I have a MK2 arcade machine which is under construction at the moment. MK4 for the Ps1. MKDA, MKD and MKA (MKA sucked..sorry) for the Ps2 MKDA and MKD were great games. And ofcourse I have Mortal Kombat 2011 Komplete Edition. Thank you Boon, Tobias, Vogel and everyone else I forgot to mention for creating this phenomenahh and keep it up for another 20 years. Psst Boon, if MK becomes 25years old please make a 3D remake of MK1, MK2 and MK3. I remember when the first Mortal Kombat came out, my friends were really into it, but I wasn't for some reason, I liked Street Fighter better. We all liked SF at the time, but I just couldn't get into MK, and I didn't have a Genesis at the time since I was an NIntendo owner all the way (they are still my favorite company, but I decided to broaden my horizons in 97) and I didn't want a watered down version with no blood. <br/> <br/>I first really took time to play MK2 when a friend got it for Genesis. I'm not sure what was different, but I enjoyed it more, so much more in fact that I played it non-stop at his house that day. The week after, I was obsessed, I wanted to find it on SNES so bad, I had the money, I had $70 bucks put away for a new game and MK2 was going to be it. The next Saturday I finally found it at a store called Best. I did what they called a dial-n-drive, basically they held it for you at the counter until you got there. I paid $65 for it. I went home that evening and was ready to play it when my mom asked if I would do something for her. I said yes and went and did it, but I really didn't do it, I did a rush job so I could play my game. She found out and wouldn't let me play it until the next day. It sucked so bad, but it was my own fault. <br/> <br/>I finally got to play it the next day and instantly fell in love with the entire MK universe. I still remember the first time I made it to Kintaro, he beat the hell out of me so many times I thought that I would never beat him, toughest sub-boss ever!! <br/> <br/>I have enjoyed MK ever since. Even though there have been some disappointing entries, there is not another experience like MK. I have enjoyed the series so much that I own every version released on the U.S. for every system. I remember when the first Mortal Kombat came out, my friends were really into it, but I wasn't for some reason, I liked Street Fighter better. We all liked SF at the time, but I just couldn't get into MK, and I didn't have a Genesis at the time since I was an NIntendo owner all the way (they are still my favorite company, but I decided to broaden my horizons in 97) and I didn't want a watered down version with no blood. I first really took time to play MK2 when a friend got it for Genesis. I'm not sure what was different, but I enjoyed it more, so much more in fact that I played it non-stop at his house that day. The week after, I was obsessed, I wanted to find it on SNES so bad, I had the money, I had $70 bucks put away for a new game and MK2 was going to be it. The next Saturday I finally found it at a store called Best. I did what they called a dial-n-drive, basically they held it for you at the counter until you got there. I paid $65 for it. I went home that evening and was ready to play it when my mom asked if I would do something for her. I said yes and went and did it, but I really didn't do it, I did a rush job so I could play my game. She found out and wouldn't let me play it until the next day. It sucked so bad, but it was my own fault. I finally got to play it the next day and instantly fell in love with the entire MK universe. I still remember the first time I made it to Kintaro, he beat the hell out of me so many times I thought that I would never beat him, toughest sub-boss ever!! I have enjoyed MK ever since. Even though there have been some disappointing entries, there is not another experience like MK. I have enjoyed the series so much that I own every version released on the U.S. for every system. The first time I ever witnessed Mortal Kombat in action was at an arcade called Aladdin's Castle at a mall on Hilton Head Island, SC when I was 14. One of the players had just performed Scorpion's fatality, and I was hooked ever since. I had always liked fighting games, but the idea of being able to finish off your opponent was just pure awesomeness. <br/> <br/>20 years later and Mortal Kombat is still my favorite video game franchise. In 2006, I decided to create my own MK fansite (FDMK) as a hobby project, and six years later it's still around. I'm also proud to say that FDMK is also the first and only MK site to have a full mobile version compatible with all mobile devices with internet access. 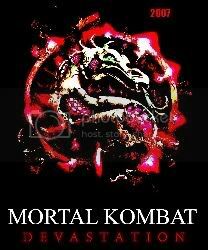 The first time I ever witnessed Mortal Kombat in action was at an arcade called Aladdin's Castle at a mall on Hilton Head Island, SC when I was 14. One of the players had just performed Scorpion's fatality, and I was hooked ever since. I had always liked fighting games, but the idea of being able to finish off your opponent was just pure awesomeness. 20 years later and Mortal Kombat is still my favorite video game franchise. In 2006, I decided to create my own MK fansite (FDMK) as a hobby project, and six years later it's still around. I'm also proud to say that FDMK is also the first and only MK site to have a full mobile version compatible with all mobile devices with internet access. I'm from the wrong generation, born far after Mortal Kombat came out. when I was little, my stepdad and mom let me play Mortal Kombat: Deadly Alliance, not knowing I was underage and what the result would be. I thought Kano resembled Stone Cold Steve Austin and used him. But Deception came out, and I gained a new outlook on the games. I went back to Deadly Alliance- where I learned that Kung Lao is freakin' awesome. I continued my experience with MK, and am now waiting until August 8th, the official day of the 20th anniversary of Mortal Kombat, to buy mk copy of Mmortal Kombat 9. I hope that it pleases me just as much as all other games. I remember when I was 6 years old and my Dad got me a copy of MK1 for my SNES and I began to build my childhood memories. Me and my brother had countless battles as Sub Zero (myself) vs Scorpion (brother). Then after a year of MK I got my hands on MK2 and thus began the reign of REPTILE! I became the ultimate fan of Reptile and MK. Now years later I still love the series and my favorite character in all of gaming. I am proud to support the MK Legacy! Reptile for life!! <div class="forumQuote"><b>MyrthoEmile Wrote:</b><br/>Sorry for disturbing, i just want to have some informations of getting in a great tournament of Mortal Kombat 9 in ps3 online interaction. I would be very pleased to show my awesome and flawless skills, here are my contact Thx 2 y'all <br/><br/> <br/><br/>Port-au-prince / Haiti <br/><br/>Tel: (509)3687-3409 <br/><br/>Tel2: (509)3351-2578 <br/><br/>Tel3: (509)4481-9916 <br/><br/>e-mail: myrtemile2008@yahoo.fr <br/><br/> Myrtho Emile</div> <br/> <br/>Hide your credit cards, it's Hati! <br/> <br/>Seriously though is this real? Hide your credit cards, it's Hati! Seriously though is this real? I remember having a terrible reaction to a game on the SNES where you could slash at monsters, and they would kind of explode in a little gooy cloud of blood, so much so that I wouldn't play it. Since it was on that system, that means it couldn't have been more than a year later that I saw Mortal Kombat in an arcade and was unusually drawn to it. <br/> <br/>I played a little in arcades, but I was more of a Street Fighter kid (as I think SFII compared to the original MK had much better gameplay). Around the time that the home ports came out, I remember getting terribly excited to play for free (rentals and being a kid) and really learn about the fatalities and all that stuff. The day it came out, I don't know if I pulled a good con, or if my mom was just being very kind, but I got to skip school and murder the computer all day. I remember loving the spine rip, probably because Zero was a ninja in those days, and what kid couldn't love a ninja? I also distinctly remember playing as Raiden and Kano enough that I was able to fight Reptile as both of them. <br/> <br/>When MKII rolled in, that was was really solidified me as a fan. I didn't really play it in arcades (and never played MKIII in one), but I was totally addicted to the home version. I loved Jax, because of things like his air throw and popup ability, which were both totally revolutionary at the time. <br/> <br/>I faded off a bit for a few years, as I bet a lot of us did, during the fourth game, and the odd console iterations. I don't remember exactly what got me excited for it, but I became terribly interested in Deadly Alliance, and started collecting all the MK Swag I could. Same for Deception, and a bit of Armageddon. Since Deadly Alliance, I've never looked back, including playing in a few tournaments for the latest game, and buying it in three different platforms now (PS3, download, and Vita). <br/> <br/>Being here since the beginning, I think the franchise is smarter, prettier, and plays better than it ever has before (and I loved the gameplay of DA and Deception). As much as I'd like to see Injustice, I can't wait for another proper Mortal Kombat, and to see where they take the story. I remember having a terrible reaction to a game on the SNES where you could slash at monsters, and they would kind of explode in a little gooy cloud of blood, so much so that I wouldn't play it. Since it was on that system, that means it couldn't have been more than a year later that I saw Mortal Kombat in an arcade and was unusually drawn to it. I played a little in arcades, but I was more of a Street Fighter kid (as I think SFII compared to the original MK had much better gameplay). Around the time that the home ports came out, I remember getting terribly excited to play for free (rentals and being a kid) and really learn about the fatalities and all that stuff. The day it came out, I don't know if I pulled a good con, or if my mom was just being very kind, but I got to skip school and murder the computer all day. I remember loving the spine rip, probably because Zero was a ninja in those days, and what kid couldn't love a ninja? I also distinctly remember playing as Raiden and Kano enough that I was able to fight Reptile as both of them. When MKII rolled in, that was was really solidified me as a fan. I didn't really play it in arcades (and never played MKIII in one), but I was totally addicted to the home version. I loved Jax, because of things like his air throw and popup ability, which were both totally revolutionary at the time. I faded off a bit for a few years, as I bet a lot of us did, during the fourth game, and the odd console iterations. I don't remember exactly what got me excited for it, but I became terribly interested in Deadly Alliance, and started collecting all the MK Swag I could. Same for Deception, and a bit of Armageddon. Since Deadly Alliance, I've never looked back, including playing in a few tournaments for the latest game, and buying it in three different platforms now (PS3, download, and Vita). Being here since the beginning, I think the franchise is smarter, prettier, and plays better than it ever has before (and I loved the gameplay of DA and Deception). As much as I'd like to see Injustice, I can't wait for another proper Mortal Kombat, and to see where they take the story. The Only Ones I've Played Are MKT (N64 Version Which Angered Me Cause I Couldn't Play As Goro) And MK9. So....Yeah Nothing Much To Remember. Still remember playing the beta versions in the arcades: Mk1 Goro couldn't be knocked down!! MK4 Noob with the Scythe til they took him out, then the screen would go black when you did a fatality with anyone. Every week the mk4 machine did something different. Was like playing a new game every time. MK 4 was definitely rushed. Tanya's air fireball color and direction changed 4 times. Just read the interview on the home page. This is truly the best JT interview i've read and i'm eagerly anticipating part 2!! <div class="forumQuote"><b>PickleMendip Wrote:</b><br/>Just read the interview on the home page. This is truly the best JT interview i've read and i'm eagerly anticipating part 2! !</div> <br/><a href="http://www.mortalkombatonline.com/content/forum/showmessage.cds?id=146714">Over here</a>. I remember sitting in my room (13 years old), and a buddy of mine called me up. He said "Dude...You HAVE to get to Peter Piper Pizza right now. There's a game where guys are ripping other guys heads off and stuff. "...Hahaha...Of course, he was speaking of MK1. I got on my Huffy and high tailed it down to the pizza parlor. There was a line, literally, out the door with people waiting to play this game. I was able to push my way through, and I remember getting a glimpse of the Sub-Zero's fatality. Shock and awe...There were no words. That was the beginning of becoming an MK fan. I really miss the arcades in the early 90's. I would love to go back for just one day. I'm with you. I have the SNES, ARCADE, and SEGA GENISIS versions of MK, MKII, MK3, and UMK3!!! But they are all emulated on my PC. Skip ahead to a few months after that. My aunt used to buy me SNES games through a friend of hers. Once it was Sim-Earth, another time it was Wayne's World, and then it was Mortal Kombat. My father did not know it was the same game that had been on the news as the blood had been removed and the Fatalities had become Finished Moves. He actually thought it was cool that I was playing such a 'manly' game rather than cutesy Super Mario World. My cousin, Mike, gave me a list of the Finishing Moves, but I did not know what to do with them nor when to do them. I didn't go to arcades when I was a kid except for those few times we went to Chuck-E-Cheese. So when the words 'Finish Him/Her!' flashed on the screen I would just uppercut them. I do remember thinking that The Pit was brutal and awesome, though. A few months after I'd gotten a bit bored with the game, I went to a friend's birthday party - with my cousin Mike - at a place called Sahara Sams. It had an epic playset with a huge ballpit and a tower to climb, but soon we all started to gravitate to the arcade area. There, with a huge flock of kids, was Mortal Kombat II. Mike was really excited and we joined the other kids, watching a round between Liu Kang and Kitana. The sprays of blood, the sounds, the music. And then the words 'Finish Her,' I recognized it. Liu Kang, upgraded from black pants to pants with red trim, suddenly turned into a huge green dragon and chomped Kitana's upper body off. My cousin and I went ballistic - all of us around the machine went ballistic - and that's when I realized that the moves Mike gave me had to be entered in at that moment. Imagine my disappointment in seeing the toned down - but still pretty awesome - Finishing Moves, wishing there was a blood code as there was in Sega Genesis, and so on. But Mortal Kombat II was my main obsession, and a month after that I received in the mail the Gamepro magazine with Mileena on the cover. The obsession started. I watched for that game whenever I walked by an arcade, dragging my parents in, begging for another round. I studied the movelist, I drew the characters, I memorized the stories and the methods on how to find the secret characters. When I learned that MKII was not only coming onto the SNES but also coming with the blood in-tact, I think my ten year old head all but split in half in the excitement. That whole Summer prior to it's home release I waited, I continued studying it, I read every line in Gamepro for any kind of MK information. My father relented and even bought me MKII while I was in school, and when I came home and popped it in, the very first thing I did was pick Liu Kang and Kitana in a second player match - it was how I practiced - and I did an uppercut. That spray of blood, that epic and unnaturally red spray of blood, the match, and finally doing the same Fatality that really started it all for me. I've been hooked ever since. I loved when the movie came out in 1995. We'd gotten a bootleg of it, and I remember watching it with my family and their friends and my father asking me who Sonya was, and seeing them all enjoy it. Awesome night, seeing something I loved being enjoyed by others. I fell away from it during the late 1990's and early 2000's. MK4 wasn't a bad game at all, but it wasn't my favorite, I was getting older and distracted with other things. I did briefly get really into it again when an ex had MKGold, but since I didn't own a Dreamcast it didn't last long. I watched the television series, I watched the cartoon. When Deadly Alliance came out I didn't even notice it, but when I saw Mileena in Deception I bought a used PS2 and scored all of the newer - at the time - games. I played the hell out of them, in particular thinking that MKShaolin Monks was damned great despite the chunks of canon it changed. Deception is probably my favorite of that generation. And now it's 2013. Those of us that have been loyal fans for twenty-years have watched this series explode into pop culture, fall by the wayside, rise above mediocrity, and finally reboot itself in one of the goriest and epic titles in the entirety of the franchise. We're older, we're desensitized to videogame violence, we've played other games and we've developed other hobbies. A lot of us work, we bought the latest game with our own money. What brings us back is different for all of us, but what brings me back is the feeling I get. The mixture of nostalgia and modern appreciation, seeing the inspirations behind the games - Bloodsport, Big Trouble in Little China, Enter the Dragon - and seeing it as a work of art with a pretty compelling storyline with unique characters. From the twisted setting of the Wastelands of Outworld to the serenity of Edenia, the game's world draws me in. I think it was John Tobias who said something to the effect of 'the one thing that Mortal Kombat does for all of us is bring us to a place where we can create.' I'd agree to that, and aside from that it's damned fun. I think I'll go fire up the Playstation 3. Hello MK-people-fans out there, were are your nostalgic stories? I realy like all the stories so far but I know there are a lot more people who've experienced nostalgic stories like the rest. Please write them down, I think a lot of people will appreciate it. hey man , i have that guy's same issue , where can i register in the MK tournaments going on ?? need info plz if anyone can help , would be totally appreciated. Thanks! Hello Madjera999, register yourself on the mainpaige or try to login and you are forced to register. Those MK tournament you can vote for are freely accesable. My first experience with Mortal Kombat was Mortal Kombat Trilogy for the Nintendo 64. It was a rental, so It had to be returned at the end of the week. Nonetheless, my brother, one of my sisters, and I enjoyed it. I was surprised when my stepdad bought a SNES and several games for the Genesis, MK2 and MK3 being among the games. Later, a Genesis was also purchased along with several games for that, MK2, MK3, and UMK3 being among the games. I remember reading about Mortal Kombat Armageddon in a Game Informer magazine lying around in the house. My siblings and I were excited for that game because it had all the characters in it. We didn't have a PS2 or an XBox at the time. My brother even tried to write a fanfiction for Mortal Kombat in a notebook. After we moved to another place, we just pushed Mortal Kombat into the backs of our minds. After we moved again and we finally got a PS2, my mother took us to GameStop to get us a PS2 game. I saw Mortal Kombat Armageddon and decided I wanted it. My mom said I wouldn't have liked it. A week later, my sister got Mortal Kombat Deadly Alliance for the GameCube to make up for my not getting Armageddon. Deadly Alliance, along with Soul Calibur 3, reignited my interest in fighting games. A few years later, there was a video game arcade-like place that was going out of business. I saw Mortal Kombat Deception among the games being sold, so I got my hands on it. I was impressed by Deception. My sister liked going into Konquest and punching the townspeople. Years after that, my brother found out about emulation. I figured I could try it and downloaded all the klassic games I grew up on, along with the original Mortal Kombat and Mortal Kombat 4, a couple of klassic games I had yet to play. After that, I decided to order Armageddon for the Wii off of Amazon. Because the Wii was in my brother's room, I practically sequestered myself in there... until the Wii stopped working. Mortal Kombat has 22 great years behind it, and here's to 22 more years. When I first saw MKI in the arcades, I was like... whoa!!! that's awesome! I was really excited when it came to the SNES. One of my fondest memories is the button mashing for the "Test Your Might" bonus round.